Like most UK golfers I was aware of College golf in the United States (US). I had heard TV commentators reference the stellar college records of Phil Mickelson and Tiger Woods at various times. I also knew that from our side of the pond Graeme MacDowell and Luke Donald had studied and played golf in the US and done very well. As that was broadly the extent of my knowledge I thought I should try and find out a bit more. 1) There are about 1,300 colleges and universities across the US. Not surprisingly each one is different in terms of student numbers, sports facilities, budgets and scholarship packages. In Year 1 a student is a ‘Freshman’, Year 2 a ‘Sophomore’, Year 3 a ‘Junior’ and finally in Year 4 a ‘Senior’. 2) Non-profit Athletic Associations organise competitive men’s and women’s sport for the US colleges. It is big business too. The better men’s football and basketball teams play in front of huge crowds, matches are televised and these sports generate millions of dollars of revenue for their institutions. All other sports, of which golf is one, whilst prestigious to differing degrees, are unprofitable to run for their colleges. The primary Association is the National Collegiate Athletic Association (NCAA). This body focuses on the larger colleges. It has history too – the first men’s golf event being staged in 1897. The National Association of Intercollegiate Athletics (NAIA) performs a similar role for smaller colleges. It has held a men’s golf championship since 1952. The National Junior College Athletic Association (NJCAA) completes the group, arranging sporting events for community and junior colleges. It held its first men’s golf championship in 1959. 3) Each Athletic Association is split into Conferences based on geographic regions. Colleges are then split into different Divisions – normally I, II and III. Generally, the larger schools compete in Division I and smaller schools in II and III. The NCAA, as it deals with the larger colleges with the most resources, is at the pinnacle of US college golf. In turn the Division I colleges attract the best golfers as they offer the best coaches and practice facilities and compete in the elite competitions. Division I of the NCAA is therefore the area that the interested observer should focus their attention on. 4) Only Division I and Division II schools can offer sports scholarships to athletes. In Division I There are currently c.285 colleges offering men’s golf scholarships and c.255 offering financial support for women. The NCAA allows 4.5 men’s and 6 women’s scholarship per college golf program. A one week window exists in mid-November every year where National Letters of Intent (NLIs), essentially 12 month commitments for the following academic year, can be entered into by prospective students and institutions. I believe there are currently c.100 GB&I golfers in the US College system. Larger colleges run squads of between 7-12 players normally. This can be problematic – particularly after the settling-in Freshman year – as most events are five person affairs, meaning some players struggle to get selected and therefore don’t get to play competitively. 5) The NCAA supports 31 regional Conferences for college’s that play men’s golf – 28 of them support women’s golf. These are: – American Athletic; America Sky; Atlantic Coast; Atlantic Sun; Atlantic 10; Big East; Big South; Big Ten; Big 12; Big West, Colonial Athletic Association; Conference USA; Horizon League; Ivy League; Metro Atlantic Athletic, Mid-American; Mid-Eastern Athletic; Missouri Valley; Mountain West; Northeast; Ohio Valley; Pacific-12; Patriot League; Southeastern; Southern; Southland; Southwestern Athletic; Summit League; Sun Belt; Western Athletic; and West Coast. The underlined ones have provided the better teams in recent years. 6) The Conferences and Divisions hold various regional competitions throughout the Fall and Spring seasons. Five man teams compete for each college with additional team members playing individually sometimes. From October onwards Golfstat publish Divisional rankings for the Teams and Individuals based on that season’s performances. These events are followed closely and act as a precursor to the NCAA finals series – Regionals followed by a National – which takes place every May. Finals are held for each Division but the Division I event is clearly the US College Major. The NCAA Division I Championship is given TV coverage by the Golf Channel in the USA. 7) The winners of each Conference are granted automatic entry to the Regional Championships. The Golfstat rankings are then used by the NCAA Golf Committee to select the other teams and individuals that will participate. In total 81 teams fight it out at six NCAA Division I Regional Championships held across the country. The five teams with the lowest team scores at each of the Regional qualifiers progress for both the Team and Individual National championships. The player not affiliated with one of the other teams in their Regional with the lowest score also progresses to play in the Individual event. 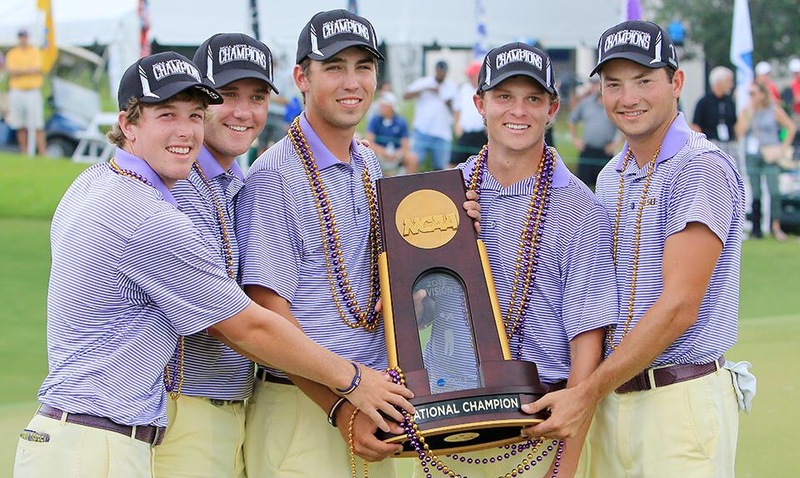 8) The NCAA Championship National Finals – the premier event in US College golf – is played annually at the end of May. 30 teams of five players plus six individual qualifiers take part, making a total field of 156 players. Since 2015 the Women’s event has preceded the Men’s on the same course. The men’s now consists of 54-holes of stroke play from Friday to Sunday before a cut is made. Thereafter the top 15 teams and nine individuals not on an advancing team will play a final 18 holes on the Monday. The results from these 72-holes will determine both the Individual Champion and the top eight teams that will advance to the Team match play stage. The Team Champions, which is the primary focus of the NCAA, will then be finalised on the Tuesday and Wednesday. This entry was posted in U.S. College Golf and tagged Alabama, Division I, Georgia Tech, Golf, LSU, NAIA, NCAA, NJCAA, Oklahoma State, SMU, Stanford, UCLA, US College. Bookmark the permalink.